Green anoles are small, arboreal lizards found throughout most of the south-eastern United States. While they gain their common name from their vivid lime-green coloration, these lizards are capable of color change, and may spend just as much time displaying various hues of brown as they do green. Contrary to popular belief, these color shifts are more a result of mood and temperature than of their surroundings. Green anoles are common and inexpensive lizards that can be very rewarding to keep if properly cared for. Male green anoles, which are typically much larger than females, reach full size at around 8 inches in total length. Females are usually in the 6 inch range, and of a more slender build. 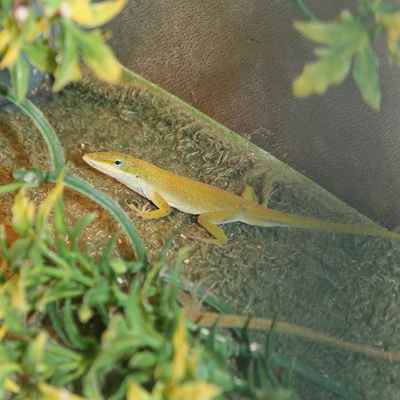 If all husbandry and nutritional needs are met, anoles can live up to 7 years in captivity. Purchasing younger (smaller) anoles will ensure a longer life under your care. Despite their small size, green anoles should be given plenty of space as they are active and agile creatures. Consider a 10 gallon terrarium the absolute minimum size for a single anole. A 20 gallon enclosure (preferably one with more height and less floor space) would be more ideal for a pair or trio. Glass terrariums designed specifically for reptile use are highly recommended as they often come equipped with a secure screen lid which makes controlling temperature and humidity much easier. The ambient or background temperature within the anole enclosure should be around 80 degrees during the day and may drop as low as 70 degrees at night. However, a slightly warmer basking spot should be provided. This can be in the form of a log or rock that reaches 90 degrees during the warmest parts of the day, and stays a few degrees warmer than the rest of the enclosure at night. Nocturnal (red) heat bulbs, standard heat lights (coupled with heat pads for nighttime), and ceramic heat emitters are all excellent ways of providing your lizards with an appropriate thermal gradient. Supplemental full spectrum lighting is necessary during normal daylight hours. Fluorescent bulbs, specially designed for reptiles, emit rays in the UVB wavelength, which is vital to the lizards ability to synthesize vitamin D3 and to in turn process dietary calcium. These tropical lizards require moderate to high levels of humidity within their captive environment, and the proper choice of bedding is key to maintaining these healthy levels. Reptile (orchid) bark works well, as do coconut husk substrates and cypress mulch. Do not use sand, gravel, or any other overly drying substrate for anoles. As an arboreal species, be sure to provide your anoles with a variety of sticks, logs, and plants on which to climb. Grapewood and manzanita branches are ideal, as are both live and plastic plants and vines. Using plants with broad leaves will ensure ample space for water droplets to collect, which will be drank by your lizards. While green anoles will seldom drink from a standing source of water, a small and shallow dish should always be present and kept full. This will only provide your lizards with drinking water (should they desire it) but more importantly will aid in increasing the ambient humidity within the enclosure. Humidity levels should be kept high within the green anole terrarium. Heavily misting the entire contents of the enclosure twice a day is typically sufficient. This will also provide your lizards with water droplets to drink. You do not want the substrate to become soggy, or be constantly wet. Instead, spray just enough water to simulate the water droplets and humidity levels present after a brief rain shower. Green anoles are primarily insectivores, and the captive diet should reflect this. The majority of their diet should consist of appropriately sized crickets, mealworms, waxworms, roaches, and moths. The insect prey should be no larger than the anoles head to ensure easy consumption. All prey items should be dusted regularly with a high quality calcium/vitamin D3 supplement. Use of such a supplement at every feeding is acceptable for growing animals, while a few times a week will suffice for mature specimens. In addition to calcium, a vitamin supplement designed specifically for reptiles is highly recommended. The formulas and dosing of multivitamins vary widely from one manufacturer to another, so carefully read the product label prior to use. Anoles will also consume small amounts of non-living food items such as flower blossoms, over-ripened fruit, and baby food. In captivity, fruit favored baby food is the easiest way to add variety to the anole diet. Simply offer a teaspoon of puree per animal on a small, flat dish a few times a week. Papaya, banana, and guava are a few recommended flavors. While green anoles are beautiful and fascinating to watch, they do not tolerate handling well. They are quick and nervous animals which will quickly drop their tails if they feel overly threatened. It is best to enjoy anoles as you would tropical fish, that is with a hands-off approach. If you must handle an anole, do so gently and try to grasp the entire animal. Grabbing one by the tail or leg will only result in a very upset (and possibly tailless) lizard.